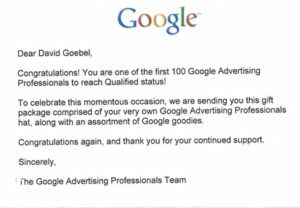 Goebel was one of the first companies to be Google Certified in Google AdWords. After completing the certification process we received the letter below from Google. 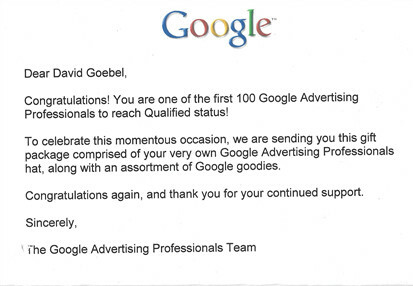 We were one of the first 100 companies certified by Google in AdWords. Our experience with the Google Search goes back a long way. We have helped dozens of companies with using search to improve sales, get new customers, and improve productivity. We have managed over $1,000,000 dollars in Google Ad budgets. In addition to Google Ad Certification with have extensive experience with Google Analytics, Google My Business, Google Shopping, and Google Site Search. All of these offerings from Google can help your company be more productive, increase sales, and get new customers. Our SEO services allow you to get new visitors to your website for free. We apply what we know from hundreds of hours of training and testing. In addition we offer Content Marketing services to create the desired content for your prospects and customers. This content will bring hundreds of visitors to your website.